On January 16, 2018, Stella Martin (nee: Szablowski) was lifted up on eagle’s wings to her heavenly home where she will dwell in the house of our Heavenly Father. Stella was born in Bayonne on June 1, 1924 to Eva (nee: Szwajkowski) and Anthony Szablowski. She was last surviving of 11 children. 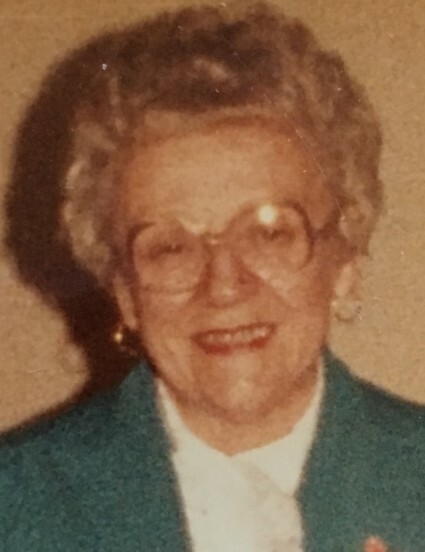 Stella was an active and faithful member of the Bergen Point Community Church where she served as Secretary of the Board, taught Sunday school, worked in the Women’s Group, did mission work and was known for her coffee crumb cake. Stella worked as a real “Rosie the Riveter” for General Dynamics on PT boats during World War II before becoming a homemaker. She was later employed by Maidenform as a printer. Stella was united in marriage to the late William A. Martin on January 7, 1948. She was the proud mother of the late William J. Martin, and Kaaren Kemp, and her husband, Dan. She is survived by her cherished grandchildren, Chad Kemp (LuAnn), Ethan Kemp (Jenny), Matthew Kemp (Birte), Robyn Kemp, Reid Kemp, Erin Martin (Jonathan Schneider) and Kristy Martin (Richard Gallitelli, Jr.); her adoring great grandchildren, Wesley, Alyssa, Kaylee, Malory and Riley Kemp, and Benjamin Dominick Gallitelli; and her dear daughter-in-law, Joanne Martin. Stella is preceded in death but her parents, her husband, her son, and her brothers, Theodore, Henry, John, Frank and Anthony Szablowski; and sisters, Hattie Dudash, Sophie Senkeleski, Helen Blicharz, Loretta Nelson and Irene Dowell. Stella is also survived by her sister-in-law, Terry Szablowski, her brother-in-law Joseph Blicharz, and many loving nieces and nephews.